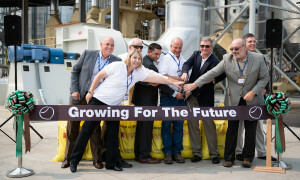 In an Aug. 15 ceremony, Hazelnut Growers of Oregon CEO Tim Ramsey, Customer Care Manager Debbie Hitchcock, Mark Nonnenmacher from Northwest Farm Credit Services, Operations Manager Jason Costa, Grower Relations Manager Tim Aman, VP Sales & Marketing Patrick Gabrish, Donald Mayor Rick Olmstead, and COO Randy Moore cut the ribbon for a state-of-the-art 120,000 sq. ft. hazelnut processing facility. Hazelnuts. Millions of hazelnuts, perhaps billions and trillions of hazelnuts. The math gets daunting and you run out of fingers and toes. On a nice flat piece of ground amid the lush farm fields of Donald in north Marion County a 120,000-square-foot expression of confidence in the state’s hazelnut industry is getting ready to reel in, sort, shell, weigh, steam, slice, dice, box and ship out as a player in a vast international market. The Oregon hazelnut crop was 31,000 tons last year. It is projected to be 56,000 by the time the processing for this year’s crop is completed at the end of October. And association officials are projecting 96,000 tons by 2025. Here is a look at some of the features of the new processing facility, courtesy of a tour Our Town and other media outlets received from Gabrish and Costa. We start in an open area behind the building that is not included in that 120,000-square-foot total. Four massive galvanized silos rise into the summer sky. Each can hold nearly 2.7 million pounds of nuts. That’s four times the capacity of the facility in Cornelius (Washington County) that the Donald plant is replacing. The silos have giant spiral attachments running down the middle, which prevents the nuts from getting damaged upon entering the silo. Everywhere the scale is immense: 30-foot ceilings, massive conveyors, elevators and bins. Storage areas the size of airplane hangars, cooled to 55 degrees, that can handle thousands of the field boxes chock full of more than 2,000 pounds of nuts. A state-of-the-art steam pasteurization unit, one of the few pieces of equipment that made the move from Cornelius. Everything is ultra-clean. For the association it’s all about finding new ways to serve its customers. China, a huge market for hazelnuts, prefers to receive its nuts in the shell. Done… there’s an in-shell processing area. Size also matters. The facility can produce six different sizes of nuts. “We can manipulate the process to get the right size for our customers,” Costa said. “We dry it, we roast it and we package it. We can make butter, we can dice it and slice it. This is the most modern technology in the country. We get everything at the right temperature and the right texture and dial in to what our customers want. Older technology didn’t give you as much control. The facility, which Gabrish said cost more than $20 million, was paid for by members of the association, which was founded 34 years ago. 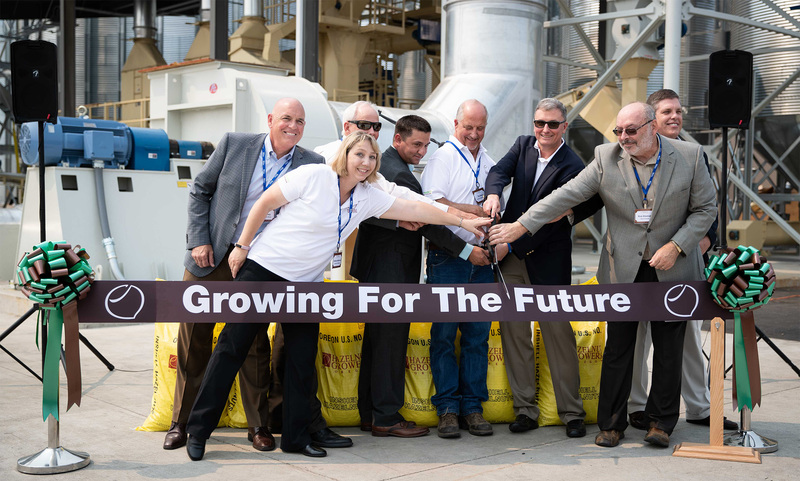 Most of the crop that the plant will process in the coming years will be grown by members, but the facility will process the crops of non-association farmers. Most of the facility is heavily automated, but the tour guides also take us through a tiny room (for a 120,000-square-foot factory) where the final inspections take place. Four conveyor belts are monitored by human inspectors, trained and certified by the Oregon Department of Agriculture. Oregon is the leading hazelnut grower in the United States, producing 99 percent of the country’s crop. Worldwide hazelnut territories are confined to land close to the 45th parallel. Other players are Italy, Turkey, Azerbaijan and the Republic of Georgia, according to Gabrish. Aman, the Mount Angel farmer, has more than 220 acres in hazelnuts. He and his brothers Tom and Kevin farm 75 of the acres and lease the rest. They used to grow ryegrass seed, sugar beet seed and dried flowers. About 80 acres of their holdings are not yet nut-bearing, a process which takes four years.